Madhya Pradesh govt. has launched Jai Kisan Rin Mukti Yojana on 15 January 2019 to waive off loans of farmers taken from various banks. All the farmers who wants to take benefits of MP Kisan Karz Mafi Yojana can download and fill MP Jai Kisan Fasal Rin Mafi Yojana application forms of green, pink (gulabi) and white color. Under this MP Farm Loan Waiver Scheme, the state govt. will waive off loans upto Rs. 2 lakh of small and marginal farmers taken from cooperative banks, regional rural banks and nationalized banks. MP Farm loan Waiver Scheme is the biggest debt waiver scheme in the state so far with budgetary allocation of Rs. 50,000 crore. MP Jai Kisan Rin Mukti Yojana 2019 is a huge milestone in the state’s history as this Kisan Karj Mafi scheme is going to benefit around 55 lakh small and marginal farmers. MP Kisaan Karja Mafi Yojana will now be implemented by this budgetary provision for bank loans taken till 12 December 2018 (revised date). 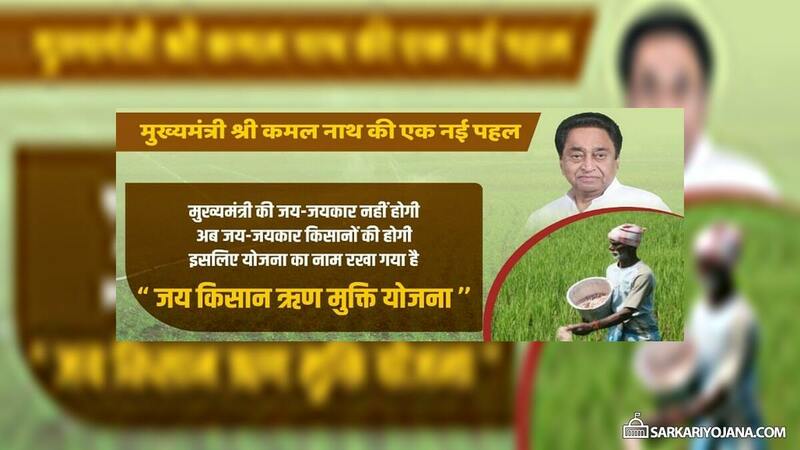 CM Kamal Nath wants to fulfill his pre-poll promise of waiving off crop loans of farmers in debt and distress. For this Kisaan Karz Mafi scheme, CM had already signed the file after taking oath. Green Form – For those farmers whose bank account is linked to Aadhaar and have taken farm loans. Pink Form – For any complaint or claim on fasal rin mochan yojana, farmers can fill gulabi form. White Form – For farmers whose bank account is NOT linked to Aadhaar and have taken farm loans. All the candidates can download the application form and avail the benefits of Kisan Karz Mafi Scheme in Madhya Pradesh. To waive off crop loans upto Rs. 2 lakh of farmers under MP Farm Loan Waiver Scheme, cabinet has already given its nod on 5 January 2019. MP Jai Kisan Rin Mukti Yojana 2019 will waive off bank loans taken till revised cut-off date 12 December 2018 (previously 31 March 2018). Congress Party had previously announced that govt. will start Kisan Karz Mafi Yojana within 10 days in case of being voted to power to reduce the debt and distress of farmers. Those farmers who want to take benefits of MP Farm Loan Waiver Scheme can fill green, pink and white application form. Around 55 lakh farmers are going to be covered under this Kisaan Karj Mafi Scheme in Madhya Pradesh. The economy of the state depends heavily on the agriculture sector and around 70% people are associated with the agriculture and allied sectors directly or indirectly. Henceforth, MP Kisan Karz Mafi Scheme is an investment in the state’s economy which can’t be strengthened without the involvement of farmers. For this MP Farm Loan Waiver Scheme 2019, the state exchequer will have to bear a burden of around Rs. 50,000 crore. The loan waiver forms could be submitted till February 5 and farmers would start getting the benefits from 22 February 2019. All the farmers who have registered themselves to pay GST and are paying income tax, cannot avail benefits under this Farm Loan Waiver Scheme in Madhya Pradesh. MP Chief Minister Kamal Nath said that the current govt. is working towards the welfare of farmers and will give its report card to the public in the next 5 years.